Executive editor Michael Schneider moves up to chief content officer, while Rose Fiorentino is now chief creative officer. Michael Schneider, who for media watchers on the west coast is generally the first person that comes to mind when TV Guide magazine is mentioned, has just solidified his rank with the company. The four-year vet has been promoted to the position of chief content officer, with two deputy editor colleagues – Nerina Rammairone and Rich Sands – stepping into his vacated slot as co-executive editors. As part of the changes, the position of editor-in-chief is being eliminated and its current occupant, Doug Brod, let go. Fiorentino was previously creative director, while aforementioned co-executive editor Sands has been with the company since 1995. To put that in TVGM listings perspective, when Sands started at TV Guide magazine, the ratings roost was ruled by ER, Seinfeld and Friends! Also promoted as part of the re-organization is Amy Miller, who moves up from general editor to deputy editor. The 2015 rate base for TV Guide magazine is 1.8 million, with a total audience reach of 13.2 million and a median reader age of 48. There is also now in the mix along with TVGuide.com the website TVInsider.com, which officially launched in March after a two-month beta phase. The latter site is also the new home of Norman Weiss’ beloved blog TV Tattle, which formerly sat at HitFix. 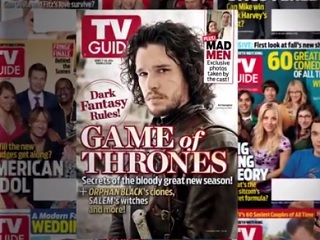 TVInsider.com, like TV Guide magazine, is headquartered in New York City, with bureaus in Los Angeles and Philadelphia. Schneider will remain based in LA. The TVGM changes were first reported by TheWrap’s Jordan Chariton.